Would you love to stay at home with your children AND earn income while doing it? If you are interested in earning extra cash for a car payment, house payment, college expenses, vacations, shopping money, or if you just want to build your food storage and don't know how to afford it then email me because I would LOVE to help you do it! I want to help you achieve success. In this economy, its always nice to have a back-up plan and income. You don't have to be a stay at home mom. You can be retired, a college student, a single gal or dude. Anyone can do what I do! 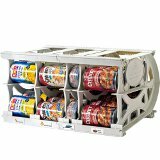 If you have good people skills you can become successful with Shelf Reliance, just by sharing the greatness of their fabulous food storage, shelving and emergency preparedness items. I am a Shelf Reliance Consultant and I earn money while helping others met their emergency preparedness goals. I LOVE what I do and I'm able to stay home and raise my three kids while doing it. Having a Shelf Reliance business means "the security of extra income will allow me to be able to go to the basketball games & dance recitals instead of missing everything because I had to work". The great thing about being a Self Reliance Consultant, is you can work as little or as much as you want to! If you are interested in joining my team & becoming my partner in crime, you can have your own Shelf Reliance business too! E-mail me at heather@teamshelfreliance.com and I will send you all of the information you need to get started. I will also be your support system to help you with anything you need. Conduct a Shelf Reliance Party and earn commission on sales made at the party. All orders not placed through the THRIVE Q, including Food Rotation Systems, Emergency Supplies and one time THRIVE orders, will be paid out at a 10% commission rate. You will receive 20% - 32% commission for those you set up on the THRIVE Q. One of the greatest parts about being a Shelf Reliance Consultant is getting a 5% reoccurring commission check monthly! With Shelf Reliance's proprietary Food Storage Planner and monthly payment program THRIVE Q, it's easy for people to build a long term food storage on a monthly budget. Once they experience the great taste of THRIVE and learn to incorporate it on a regular basis, they'll likely remain Shelf Reliance customers for life. What does it mean for you? Monthly commission checks for life! Enroll others to join your team as consultants and earn $50 each time! As your team grows, you will also receive commissions from all of your consultants' parties, sales, and THRIVE Q signups for up to 3 levels below you. Click here to see requirements for team earnings. Define why you are going to be a consultant. Go to the website: http://homeparties.shelfreliance.com/homeparties/getstarted and click on the START HERE button. It will ask for the Enroller information. *Inorder to receive commissions, all consultants must set up a personal THRIVE Q plan for $50 - $300 in product each month. It is imperative that consultants learn to use and cook with THRIVE on a regular basis. 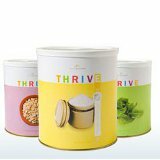 This will give them an authentic ability to teach about and help new users understand the THRIVE Q and all the benefits that THRIVE Foods have to offer.